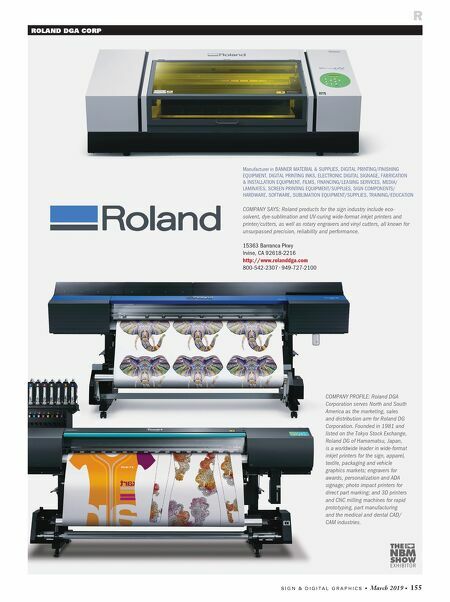 S I G N & D I G I T A L G R A P H I C S • March 2019 • 155 R ROLAND DGA CORP Manufacturer in BANNER MATERIAL & SUPPLIES, DIGITAL PRINTING/FINISHING EQUIPMENT, DIGITAL PRINTING INKS, ELECTRONIC DIGITAL SIGNAGE, FABRICATION & INSTALLATION EQUIPMENT, FILMS, FINANCING/LEASING SERVICES, MEDIA/ LAMINATES, SCREEN PRINTING EQUIPMENT/SUPPLIES, SIGN COMPONENTS/ HARDWARE, SOFTWARE, SUBLIMATION EQUIPMENT/SUPPLIES, TRAINING/EDUCATION COMPANY SAYS: Roland products for the sign industry include eco- solvent, dye-sublimation and UV-curing wide-format inkjet printers and printer/cutters, as well as rotary engravers and vinyl cutters, all known for unsurpassed precision, reliability and performance. 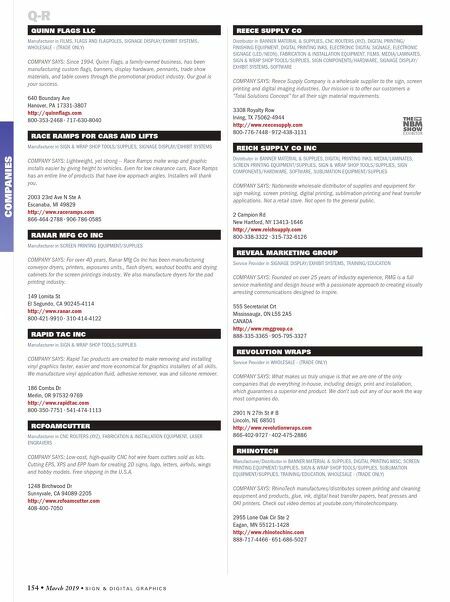 15363 Barranca Pkwy Irvine, CA 92618-2216 http://www.rolanddga.com 800-542-2307 • 949-727-2100 COMPANY PROFILE: Roland DGA Corporation serves North and South America as the marketing, sales and distribution arm for Roland DG Corporation. Founded in 1981 and listed on the Tokyo Stock Exchange, Roland DG of Hamamatsu, Japan, is a worldwide leader in wide-format inkjet printers for the sign, apparel, textile, packaging and vehicle graphics markets; engravers for awards, personalization and ADA signage; photo impact printers for direct part marking; and 3D printers and CNC milling machines for rapid prototyping, part manufacturing and the medical and dental CAD/ CAM industries.